As a result of International Ballet Workshops (IBW) Summer 2018, three young Australian dancers travelled to Latvia, Europe in April, to perform at Riga Spring 2018 – the XIV Children and Youth International Choreography competition – and all three dancers were awarded Silver medals! And this month, another dancer is travelling in the USA, as a result of a scholarship awarded by Dusty Button at IBW Winter 2017! 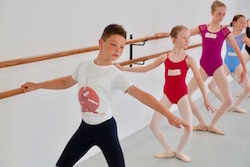 Ava Skinner (Dance School of Distinction, VIC), Ruby Cross (Amanda Bollinger Dance Academy, QLD) and Cooper Tate (Five Star Dance Academy, QLD) attended IBW’s Summer 2018 “British Ballet” Series in January, where the international guest teacher was Ken Ludden. 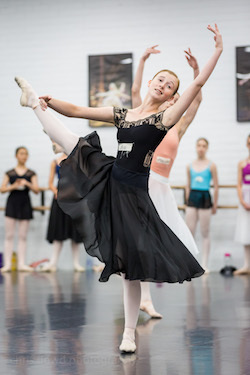 Ludden, director of the Margot Fonteyn Academy of Ballet in New York, selected the dancers to dance in Riga, representing Australia, their dance schools and the legacy of Margot Fonteyn herself. While in Riga, the dancers received daily coaching from Icelandic ballerina Sveinbjorg Alexanders and performed in front of a jury, including members of numerous European companies such as La Scala, Saint Petersburg, Moysiev Dance Company, Estonian National Ballet and Kiev. All three Australian dancers went on to win Silver medals, and Cooper was also asked to perform his variation (Alain, from Frederick Ashton’s La Fille Mal Gardee) at the Gala evening for the general public. Dusty Button and Tianna Koolloos. Photo courtesy of IBW. Tianna Koolloos (The Conlan College, NSW) is currently travelling in the USA, attending the BellaMoxi Dance Convention. The opportunity was given to her by star ballerina Dusty Button, who was IBW’s international guest teacher in July 2017. What’s on offer next? There are more life-changing opportunities to come at the next IBW tour, the Winter 2018 “Classics to Contemporary” Series! Registrations are now open, and some classes are already sold out. This winter’s International Guest Teacher is Nadia Thompson, co-director of Ballet Hagen, Germany. In Sydney and Auckland, Thompson will be joined by Riccardo De Nigris, house choreographer of Ballet Augsburg, Germany. In Perth, Melbourne and Brisbane, Thompson will be joined by husband and wife team Jan Gonscak (Slovakia) and Lily Bones (Australia/Europe). Read all about the guest teachers here. There are several international opportunities in store for dancers attending the IBW Winter 2018 “Classics to Contemporary” Series. Thompson will offer selected dancers the chance to attend a week of company classes at Ballet Hagen, Germany. They will be able to observe the company in rehearsal and attend performances, and get to understand how the theatre systems work in Germany. She will also introduce students who are of exceptional talent to Christopher Powney, director of The Royal Ballet School. The introduction will be done in form of a letter or email including headshots, ballet shots and preferably a video. Thompson and De Nigris will offer personal introductions to choreographers and directors throughout Europe and the States with a personal letter of recommendation. De Nigris will also provide a selected student with a solo for use in a competition such as YAGP. Thompson will also select students to travel to Hinsdale Dance Academy in Chicago, Illinois, to participate in its summer workshop, with international guests teachers. Besides these amazing opportunities, there are several awards to be won at the upcoming IBW, including Capezio Most Exceptional Attitude, Bloch Most Outstanding Young Artist, a $1000 Professional Development Award and a scholarship to attend the next round of IBW. This is one Winter workshop not to be missed! Some classes are sold out already, so early registration is recommended. Head to www.internationalballetworkshops.com for all the info. International Ballet Workshops is proudly supported by Dance Informa, Capezio and DanceSurance.